News anchor: From tomorrow the lightbulbs will be gone. The Energy Agency thinks this is an important measure for the climate and claims this will save energy comparable to the heating of 80 000 houses. But it turns out that the Agency uses exaggerated and outright erroneous numbers. – Well, this is a very nice light source, but unfortunately it uses a lot of electricity. So therefore it will be phased out. Clip new picture of lawn mowing. – They waste so much. It’s like buying 10 liters of milk and throwing away 9 liters every day. 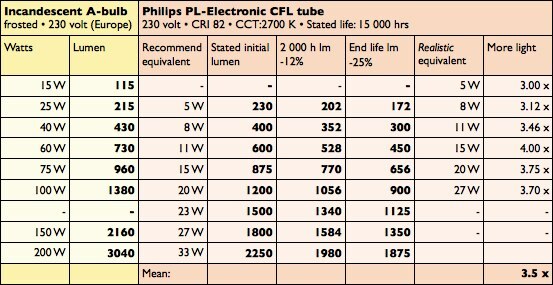 – It saves at least 80% compared with the other lamp, says Peter Bennich again (likely referring to the CFL or LED). – I have electric heating at home. The radiators turn on less frequently when I have the lamps lit. – Is it true that 90 % is pure waste? – Yes, that is my opinion. – If I use this [lightbulb] as a reading lamp for half an hour every day for a whole year except June, or use this [infrared heater] for one evening, which uses most electricity? – Lighting uses a very large part of electricity use in Sweden. – It sounds as if we are not very good at turning the lights off when not in use? – Yes! We Swedes are extra poor at turning lights off. Note how the Energy Agency representative is extremely careful to use the word ‘electricity’ rather than ‘energy’. 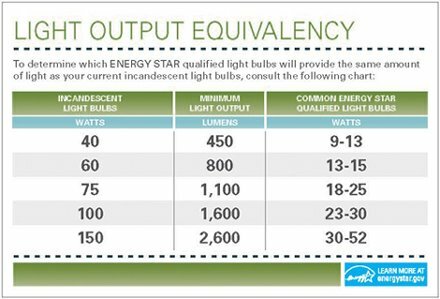 That is a very deliberate and well-coordinated strategy in order to make lighting part sound more than it is, as electricity itself is only a smaller part of total energy consumption. It’s not a lie but it’s not telling the whole truth either. The largest part of most households’ total energy consumption is space heating (or cooling in warmer areas) followed by water heating. Lighting is only a small fraction of the remaining household electricity. 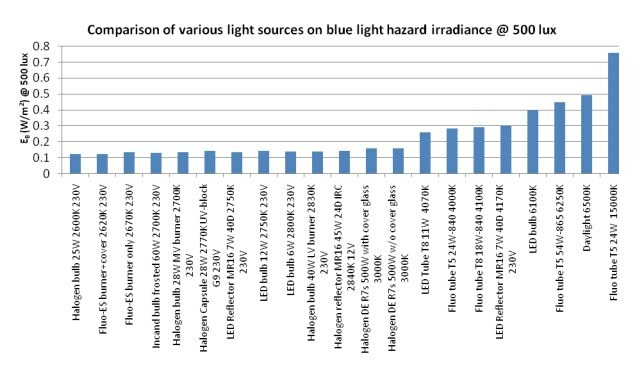 EU average according to official statistics, is less than 3% of total household energy use – of which an estimated 46% was already fluorescent or halogen at the time of the ban (!) according to the preparatory study that was used as foundation for the ban (see my post EU Energy Statistics for details and references). 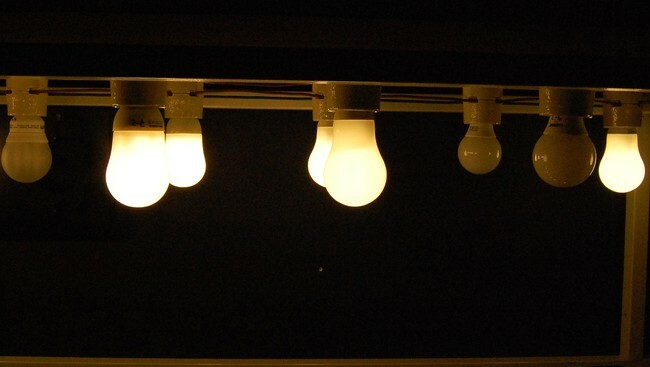 What is also deceptively concealed is the fact that the largest lighting part of national electricity use is in the commercial, industrial, public building and road illumination sectors, which use the most number of lamps, the highest wattages, and keep them turned on for most of the day or night. And most lamps in these sectors is already fluorescent or gas discharge! Some of them can still be optimised with newer and more efficient lamps of the same or similar lamp groups, better control systems etc, and by being turned off when not in use. That’s where the real savings on lighting can and are being made! Whereas the private sector lighting use is such a microscopic slice of the total energy pie that it can easily be saved without banning any lamps. I am sadly becoming more and more convinced that this whole lamp issue is just a diversion to keep us all believing that both we and politicians have really made a difference now by switching a few lamps. The planet is saved and we can all go back to sleep and keep consuming as usual. While the multi-billion-dollar CFL and LED industry is laughing all the way to the bank. When the truth is that no one wants to rock the boat and start restricting the things that really pollute and deplete resources. Such as petrol-fueled cars & airplanes and the gazillions of electrical gadgets, clothes, trinkets and junk food we’re continuously being prodded to buy more and more of. No restrictions there. STEM engaged in ill conceived, inconsistent and ad-hoc promotions. STEM did not take into account the consumer perspective but rather concentrated exclusively on energy efficiency and technical issues. STEM relied indiscriminately on the information provided by the vendors. STEM was very passive about dealing with CFL technology failures that affected main benefit claims. STEM did not study, did not know or admit technology limitations. STEM did not demand or work to establish minimum performance requirements. STEM never questioned why long life claims were not backed by a guarantee. 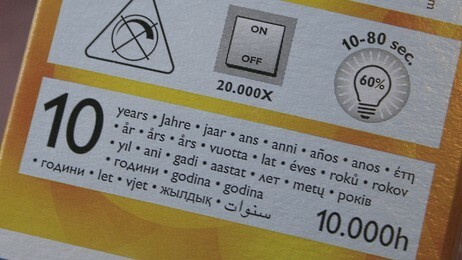 The compact fluorescent lamp is becoming more common in Swedish homes, with the phase out of the incandescent bulb. But the lamp has proven to be a fire hazard in itself. The problem with CFLs is that the plastic surrounding it easily burns at high temperatures. – Unfortunately it leads to many bigger fires when the plastic starts burning. In some cases there is only a smaller incident but those in turn may lead to more damaging fires. In the worst case scenrio people can die if you’re in a house and don’t get out in time, says fire investigator David Wiklund at Södertörn’s fire department to Rapport. Counted in numbers, fires started by lamps is a big problem. Between 1996 and 2008 1 033 fires were started by lamps. During the same period, only 96 fires were stared by coffee machines and 63 by irons. How many of these were started by CFLs specifically, the statisics does not tell us. 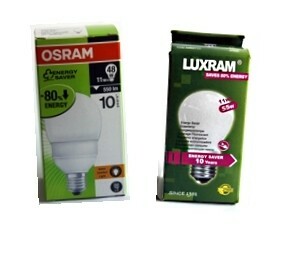 But a CFL is filled with technology which may catch fire – and the lamp [base] is enclosed by plastic. In Sweden there are no rules requiring the lamp to go out by itself at high temperatures. David Widlund wishes there were stricter regulations for the lamps than what currently exists. -It is not at all good to have a type of plastic in the lamps that may catch fire. We would rather see a fire-proof plastic, he says. As incandescent bulbs are phased out, the demand for CFLs has increased. But regulation has not caught up. -There has been little awareness of these problems, they have only arisen as demand has increased to rapidly. But STEM, the Swedish Energy Authority, will inform the EU commision about these problems, says Kalle Hashmi who is lighting expert at STEM. Today there is nothing one can do to make sure the lamp doesn’t start burning. 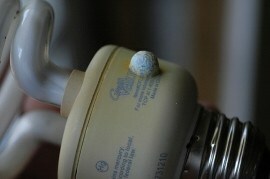 The safety markings on the CFLs themselves give no guarantee. -Compared to an incandescent bulb which in itself cannot burn, we are replacing it with this product which can start burning. 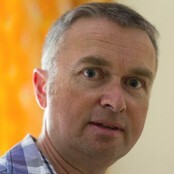 That is of course a poorer alternative, David Wiklund thinks. But back to CFLs. Many appear to have some safety thing that makes them give off a lot of foul smelling smoke as they go out but not actually burn. But if they do catch fire to the point where the glass cracks, that will add the additional hazard of releasing its mercury vapour content into the air. • Always follow safety instructions. • Don’t use a higher wattage lamp than the luminaire is marked for. 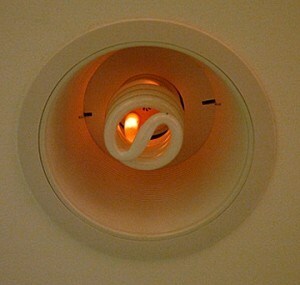 • Don’t install recessed spotlights yourself. 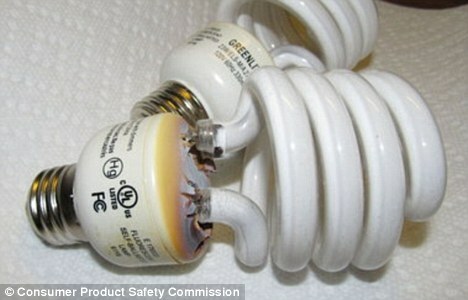 • Don’t use halogen spotlights too close to anything burnable (including house plants, which may dry out if not burn). • Don’t let children handle CFLs or halogen lamps, and do not use such lamps in luminaires which may get knocked over by playing children or pets. • Be extra careful with lamps left on when you’re asleep or not home. Don’t leave lamps with a paper shade unattended. 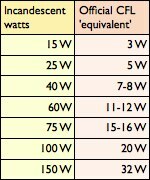 Safest (and most economical) lamp to leave on would be LEDs which do not get hot at all. 1. Should There Be a Ban on Incandescent Light? f) if they last as long as promised (without losing too much output towards the end). “During 2004, the Test Laboratory then a part of the Swedish Consumer Agency (now a part of Swedish Energy Agency) carried out its second ad hoc testing of 20 different CFLs from Osram, GE, Philips, IKEA and Sylvania. The testing authority concluded that there was no correlation between price and performance of the CFLs. The information on packaging was often deficient in terms of light quantity. Many models had light output claims that could only be achieved at the optimum operating temperature and/or in some optimum burning position that achieved an optimum internal temperature.